A feud is raging between three colonies. Although the Harvesters, Carpenters, and Blood Red Slave Hunters have been fighting since last year, this summer will secure a lasting victory for only one of them. This is the story of war and feast and … no, not famine… more feast! And of Willy, our unlikely hero who has been adopted by the Harvesters. He is from the Black-Haired Garden colony and is nothing like them. Small and young, he knows nothing of war. How can he possibly help prepare for the big battle? Willy learns that some species are parasites who never work, wandering around feeding off other colonies. Others are thieves and robbers, or killers and cannibals. And it’s always about war. Does Willy merely try to survive, or does he figure out how to be a useful member of the colony? Can an insignificant like Willy help to win an unstoppable war? At the end of each chapter, real science information called “Ant Facts” provide fascinating knowledge about the real lives of different species of ants. And they explain why Willy is going to do what Willy is going to do! 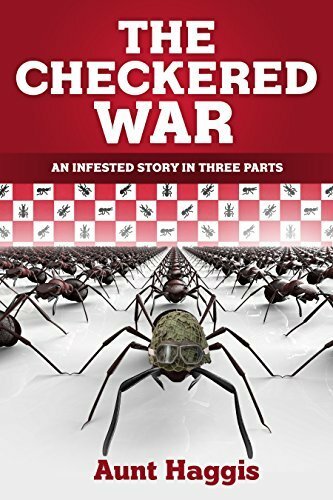 The Checkered War is an interesting adventure many children will love. Some of the things that will pull them in are the ant facts, the adventure, the war, and the Queen drama. If your child would love to know of a different life The Checkered War may be the book for them! Publisher & Date: April 10th 2018 by Alpha 81 Inc.
Aunt Haggis is a published author, photographer, and outdoor enthusiast. She literally grew up on the river studying nature, rafting wild whitewater rapids, basking in the sun, and sleeping under a canopy of brilliant constellations. When she wasn’t looking up to examine the stars at night, she was looking down by day to investigate the most intriguing of creatures … ants. You will find her discoveries in The Checkered War. Aunt Haggis has previously written seven full-length screenplays, one adult fiction novel, one illustrated novelette (which was a recipient of the Benjamin Franklin Award), a biography (of a famous river runner), and numerous magazine articles under a boring name she is required to use for business. The Checkered War is the debut of her first book for children.